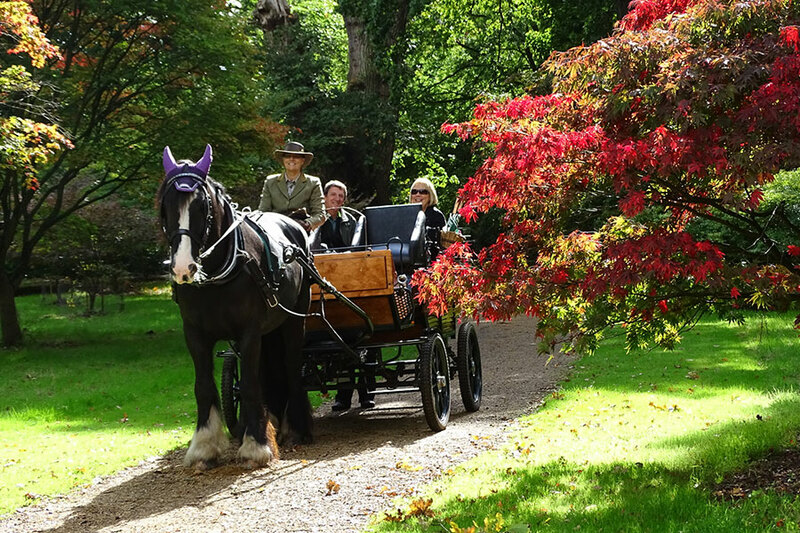 Enjoy this beautiful Royal Park from the comfort of an elegant horse-drawn carriage. Relax and unwind as you explore and discover Ancient Woodlands, glorious 18th Century Lakes, Grand Avenues, Vistas and delightful Gardens. We run all year round from outside the Visitor Centre at Savill Garden with kind permission from the Crown Estate. (see map and directions). We travel at a leisurely pace, in the heart of Windsor Great Park to the restored Cow Pond an 18th Century Lake with magnificent display of Waterliles in Summer and tranquil reflections in Winter, complete with Baroque Style Footbridge & Diamond Jubilee Arbour unveiled by Her Majesty the Queen in 2012. Joanna, your carriage driver/guide has run the tours since 2009 and will provide history and lesser known facts about the area, with well-mannered carriage horses Henry or Delwyn, your horsepower on the day. We love to provide champagne for Romantic Wedding Proposals & any special occasion. See details of our carriage tour range below. All year round on selected dates, see our Calendar (pink indicates the dates we are scheduled to run) rides take place between 10.30am & 3.30pm. Rides are popular, especially at weekends, so early booking recommended. It’s weather permitting & therefore we take cash payment on the day. We text you the day before to confirm we are running once we know the weather forecast. You can reserve up to 3 months in advance or call to check availability on the day before 10am. The carriage is open topped, so we prefer you to see the beauty of Windsor Great Park on a fine day. We will contact you by 10am on the day if weather prevents us operating. If we experience a shower whilst on a ride, fear not, we do our best to keep you dry with weatherproof lap rugs & umbrellas! Savill Building is the award winning Visitor Centre, it opens at 10am and is a great meeting place for Coffee, Lunch & Afternoon Tea & has all the facilities you need. Also there’s plenty of parking available. 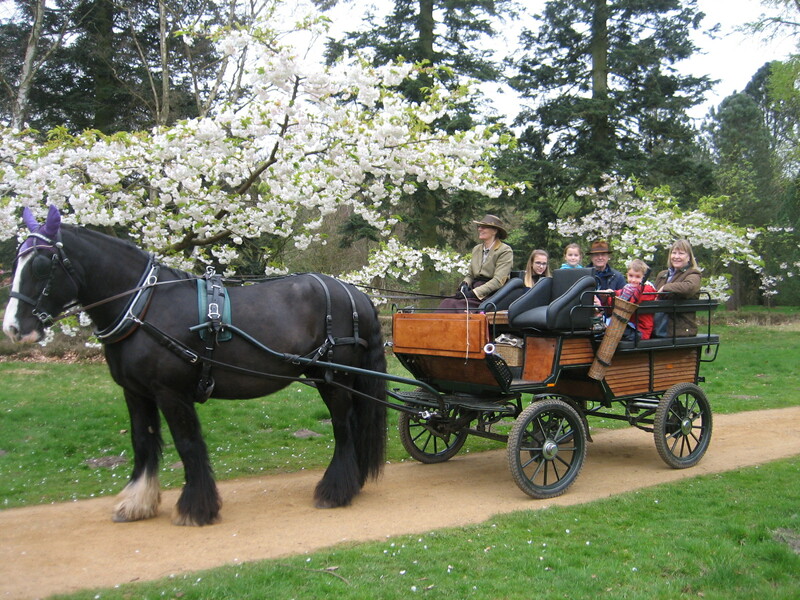 Our Country Carriage seats max 4 adults or combination of adults/children (60 stone weight restriction applies). It has two easy rise steps at the rear plus hand rails, so very easy access for the less mobile. We are proud to say it was used by Her Majesty the Queen’s Equerry & Horsemaster for 26 years, Late Lt. Col. Sir John Miller. What a complete joy! The Girls and Henry gave us an trip around Windsor Great Park to remember. It is always a pleasure to be looked after by professionals who care so much about presentation, delivery and service. Suitable for all ages, ideal for families or couples who wish to be on their own. There’s always something interesting or colourful to see at any time of year. 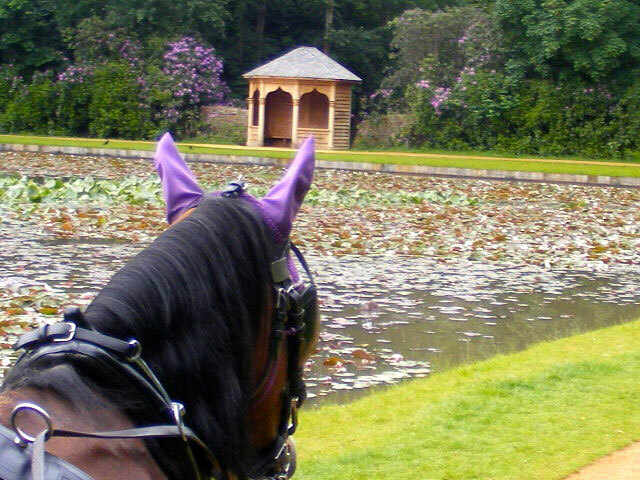 Enjoy birdsong & gentle sound of horses hooves as we make our way on Rhododendron Ride overlooking Savill Garden & The Queen Elizabeth Temperate House. 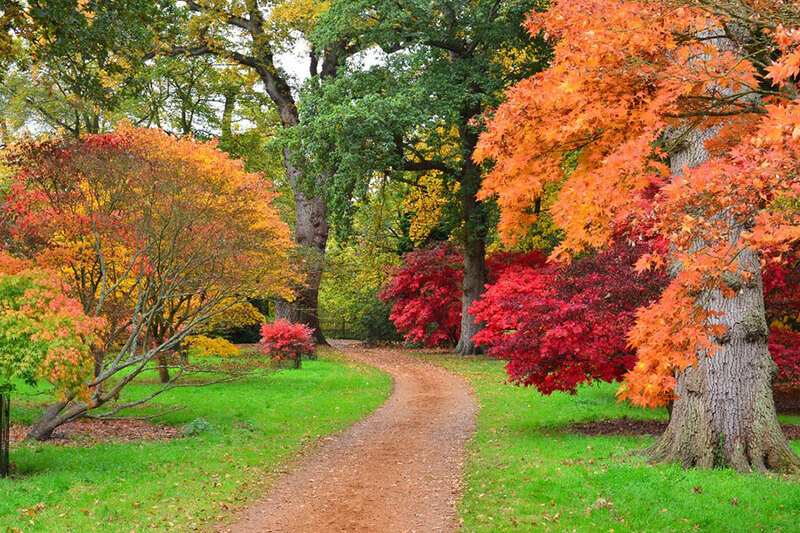 On a woodland trail through the charming Chapel Wood fragrant Witch hazels in Jan/Feb, Magnolias/Cherry Blossom in Spring, cool shade in the heat of the Summer and vibrant Autumn Colours of a National Collection of Japanese Maples. Enjoy the vista of Rangers Avenue, re-planted in 2013 to celebrate 60 years of stewardship by HRH The Duke of Edinburgh, then a ‘hidden gem’ the beautifully restored Cow Pond an 18th Century ornamental lake. The lake has a glorious display of Waterlilies in Summer & tranquil reflections in Winter, complete with Baroque Style Footbridge & Diamond Jubilee Arbour unveiled by Her Majesty the Queen in 2012. The tour continues on a circular route back to Savill Building. 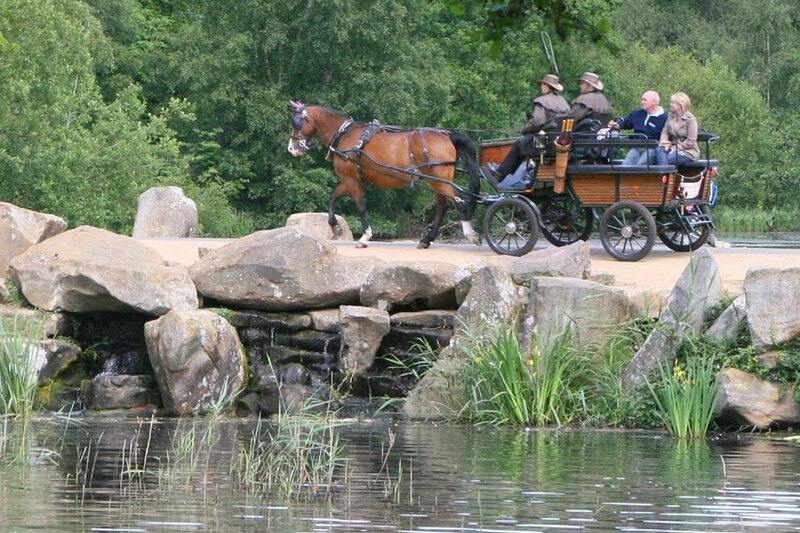 Ask about our Picnic Special or Romantic Proposal Rides where we can stop at the lakeside for you to get off the carriage and take in the atmosphere for longer, either have a picnic or just take a relaxing stroll to the footbridge and take some wonderful photographs. In addition to the route taken on the 30 min trip, the tour continues towards Bishopsgate or Smiths Lawn, past ancient oaks, beech & a magnificent redwood. As we see a corner of the Deer Park, keep a look out for Stags, you may be lucky to see some! Enjoy the views of the entrance to Royal Lodge, Cumberland Lodge & the home of the famous Guards Polo Club on Smiths Lawn, from Spring to Autumn we often seem them practicing. 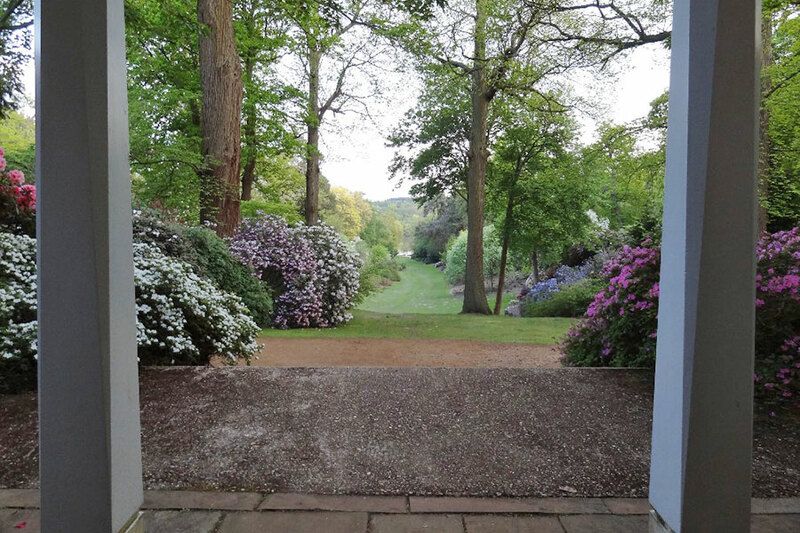 The circular tour continues on a private roads overlooking Savill Garden and lined with a collection of magnificent Rhododendrons and last but not least past one very special 950 year old Oak Tree! We always enjoy tailoring the tour and commentary to suit the day, your particular interests and the landscape/garden colours at the time of year. We can travel further into the heart of Windsor Great Park to view Equestrian Statues or Valley Gardens to see the spectacular Spring Display of Azealas at the Punch Bowl at Valley Gardens. 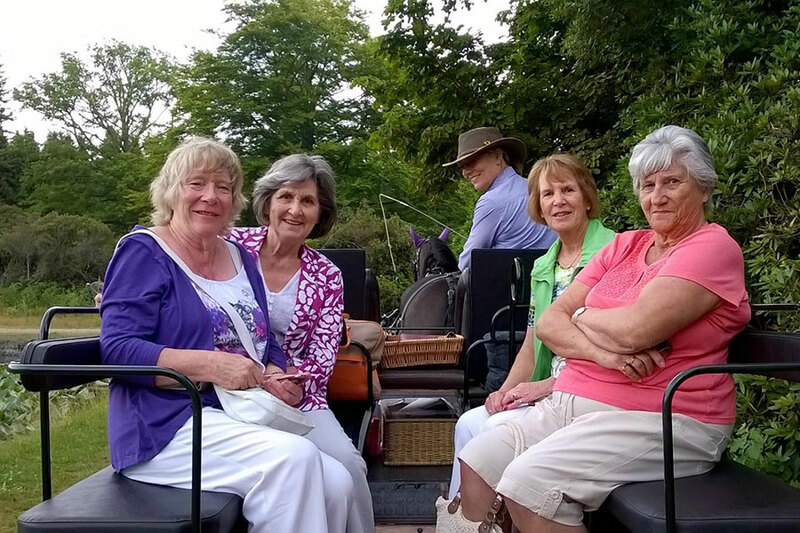 Enjoy a 60 or 90 min tour (includes a 30 min picnic stop or longer if you wish, we can tailor the ride for you) The carriage stops at the 18th Century Lake called Cow Pond a delightful & peaceful spot for you to enjoy a lakeside picnic with wildlife and waterlilies! Vintage Afternoon Tea in the Gallery Cafe at Savill Garden (Mon – Fri) Pre-booking necessary on 01784 485402 plus you can book a Carriage Ride with us on 07811 543019. Carriage Rides are weather & sufficient mid week bookings permitting. 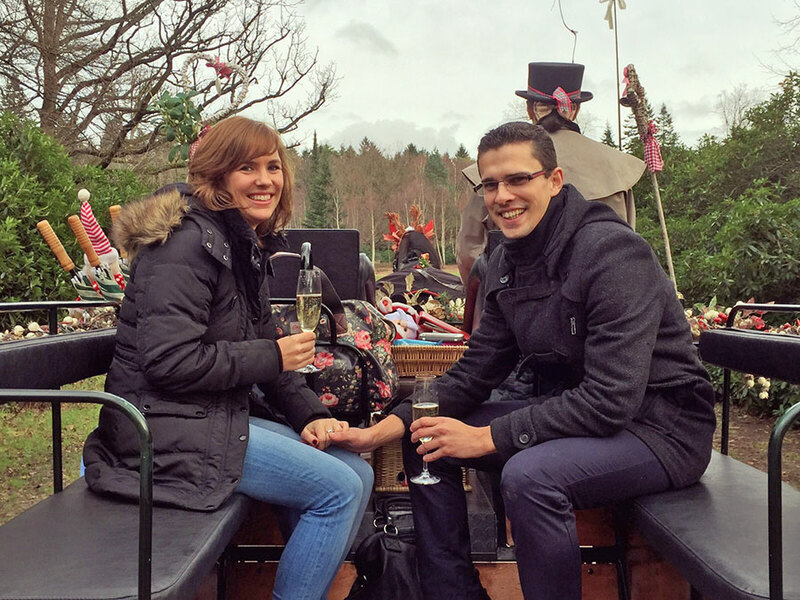 Valentine’s Day, Mother’s Day, Spring & Autumn Colour Spectacular, Windsor Horse Show weekend, Royal Ascot Week, Summer Picnic Rides & our very popular Festive Carriage Rides at Christmas & New Year! 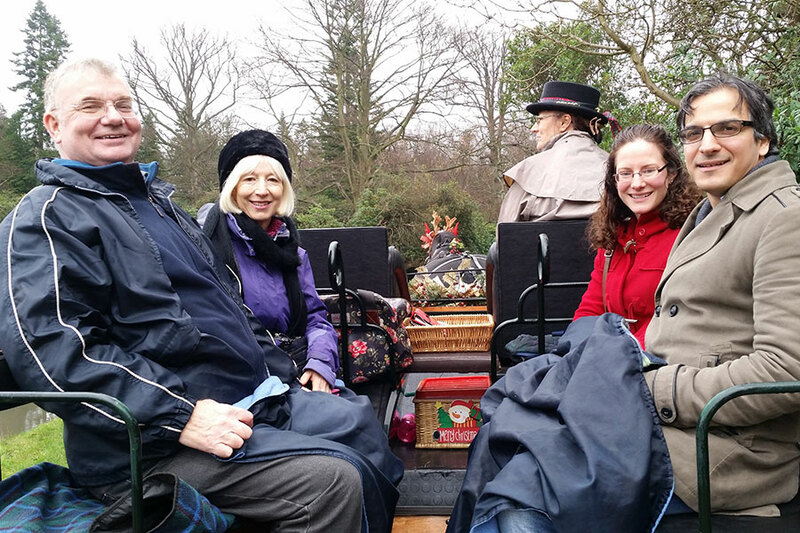 Had a wonderful hour and a half carriage tour of Windsor Great Park. Jo was a brilliant tour guide. Can not wait to return to see the park at a different season. Great value for money.